GMVN Tip N Tops Huts in Lansdowne is a deluxe guest house maintain by Garhwal Mandal Vikas Nigam. Lansdowne is a getting popular as a weekend destination. It is a hill station situated in Pauri Garhwal region at an elevation of 1,756mts above sea level. 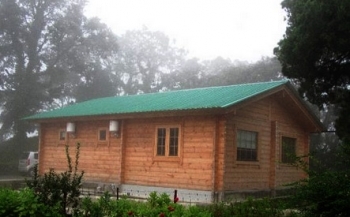 Accommodation in GMVN Lansdowne Tip-N-Top is provided in Family Suite and Huts. The resort offers picturesque views of the mighty Himalayan range and mountains of Garhwal region. As name suggest, GMVN Tip N Top in Lansdowne is located at Tip In Top point. Lansdowne is situated at an elevation of 1,756mts above sea level in Pauri Garhwal district of Uttarakhand state. It is located 42kms from Kotdwar railway station. 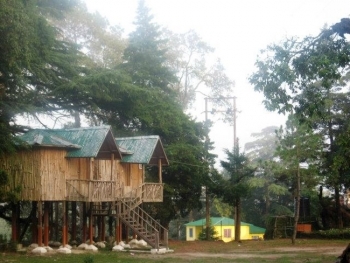 The GMVN Tip N Top rest house in Lansdowne offers 04 Super Deluxe Cottages and 03 Family Cottages. Each huts and cottages in the property have attach bathroom, hot water supply etc. There is a kitchen serving variety of mouthwatering dishes. Guest can have their favourite food prepared by rest house experienced chefs.